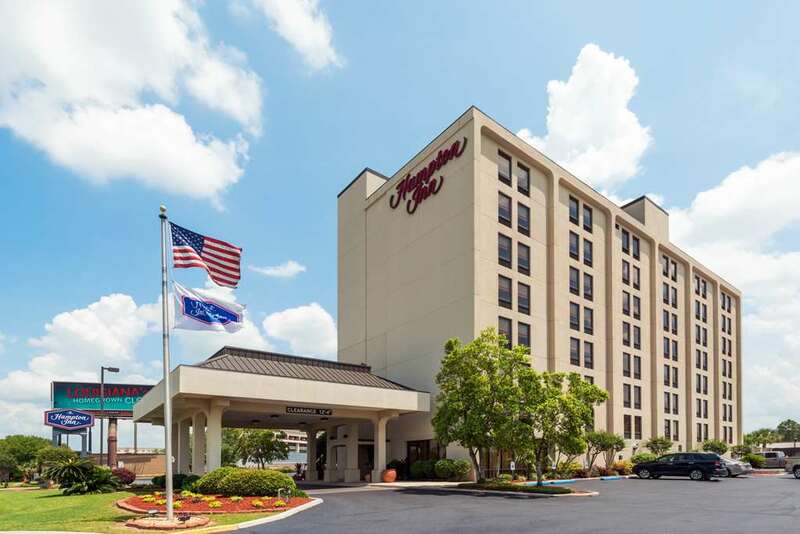 The Hampton Inn Baton Rouge I-10 - College Drive hotel is located just off Interstate 10 in Louisiana and consists of 140 elegant rooms and three meeting facilities within an eight story high rise hotel. The hotel features wireless high-speed internet access throughout the property and a new breakfast buffet which includes a variety of hot dishes. Our hotel is only four miles from the home of the LSU Fighting Tigers 2003 National Football Champions. We are twelve miles from the campus of the Southern University Jaguars 2003 SWAC National Champions. The Hampton Inn I-10 - College Drive is only four miles away from the Baton Rouge Louisiana booming downtown area which hosts an array of activities such as the Argosy Casino and Casino Rouge the USS Kidd Naval Museum Catfish Town the Planetarium The Roux House Blues Bar an exciting nightlife and many local and international fare restaurants. You will also find the River Center of Baton Rouge the State Capitol and the Historic Government District. There are many restaurants in the immediate area with that **Cajun** flavor such as Boutin*s Mike Anderson*s Phil*s Oyster Bar Parrain*s and Mansur*s on the Boulevard. Our Hampton Inn Baton Rouge Louisiana hotel features 140 elegant rooms eight stories a beautiful outdoor pool area complimentary access to a local full-service health club and three spacious meeting rooms on the first floor. Hampton Room I seats up to 40 people theatre style Boardroom seats 8 people and Hampton Room II seats 10 people theatre style. Hotel amenities include complimentary **extended** continental breakfast /6-10am/ and USA Today newspaper local calls and TV with cable and HBO. All guest rooms are equipped with voicemail coffee coffeemaker iron ironing board and hair dryer. We also offer connecting rooms and cribs. Laundry/valet services meeting facilities and refrigerators are available for a nominal fee. We love having you here at the Hampton Inn Baton Rouge in Louisiana.